Brianna and Edy’s elegant St. Pete Beach wedding featured a light pink and gold fairytale inspired theme, with an emphasis on their love for Disney. “The Don CeSar exceeded our expectations from the moment we walked through those doors until the time we left. We are going back there for our one year anniversary. It was amazing, and I could not have asked for a more perfect wedding. I still replay the day over and over,” Brianna added. 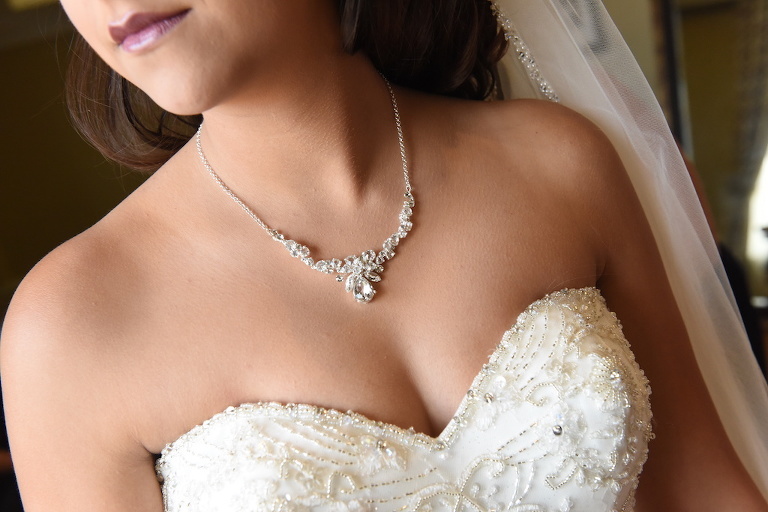 The Mount Dora bride who is also a hair stylist, knew that finding a St. Pete hair and makeup artist for her wedding was of the utmost importance to her. “I took a lot of time trying to find the right fit for me. I did a lot of research on many different places, and I found Michele Renee The Studio to be the best fit,” Brianna explained. Looking back, Brianna reminisced that her most cherished wedding day moments were her walk down the aisle and the first dances that she shared with her husband and father. “My wedding day could not have gone any better. My most memorable part of my wedding would be my dad walking down the aisle and seeing my husband look at me,” the bride shared. 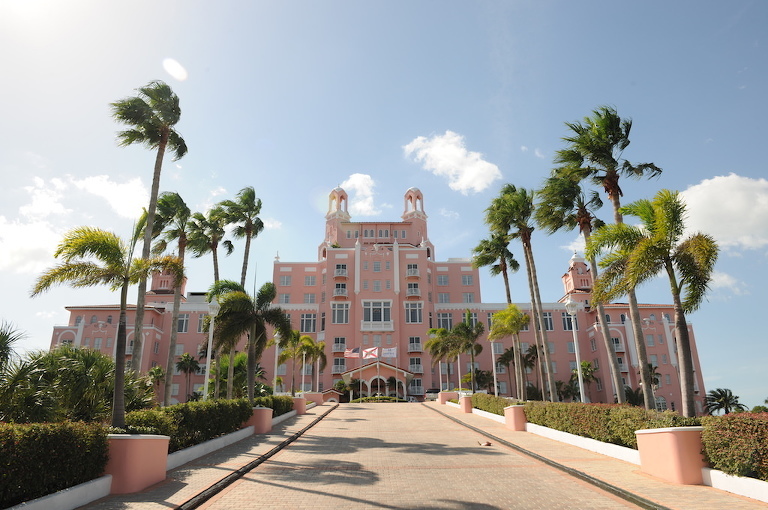 I chose The Don CeSar because I came on vacation to St. Pete Beach when I was in eight grade, and we were there every night because I fell in love with this pink hotel. One of the night’s, I saw a beautiful bride getting out of a limo, and I told my grandmother that’s where I wanted my wedding, and she said, “One day, I promise.” She gave me a picture framed of The Don, and it’s been in my house ever since. My grandmother passed away of cancer when I was in high school, but my dad kept her promise and gave me a wedding that was a fairytale for me. I want to learn more about weddings at The Don CeSar. The Don CeSar exceeded our expectations from the moment we walked through those doors until the time we left. We are going back there for our one year anniversary. If anyone is looking to have their wedding day as perfect as mine, I would highly recommend The Don. It was amazing, and I could not have asked for a more perfect wedding. I still replay the day over and over. My husband proposed at Discovery Cove in Orlando when we were swimming with the dolphins. A dolphin came up to me with a buoy that read, “Brianna, will you marry me?” On the beach there was a decorated box with my ring in it where my husband got on one knee and asked me. It has always been my dream to swim with dolphins. 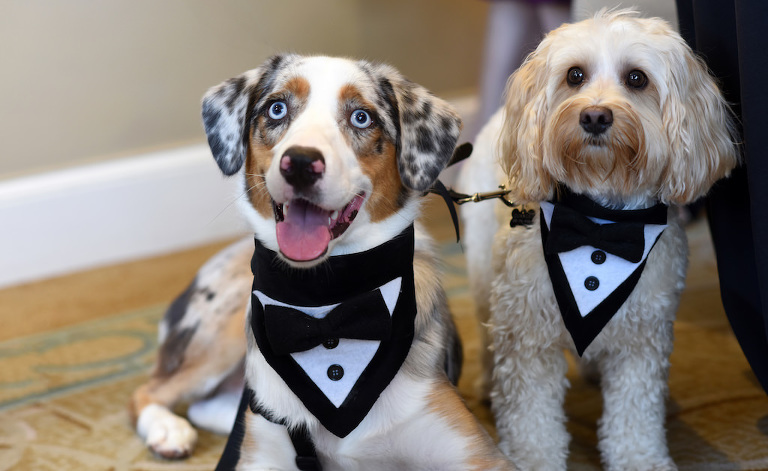 Why did you incorporate your pets into your wedding day? Our pets are our children; it was a must. They have impacted a huge part of our lives and our families lives. The Don was pet-friendly, so that was a plus. FairyTail Pet Care exceeded our expectations! They were amazing! What did you look for in a wedding hair/ makeup artist? I am a hair stylist, however I don’t specialize in wedding updos or makeup, nor did I want to to that on my wedding day. So I took a lot of time trying to find the right fit for me. I did a lot of research on many different places, and I found Michele Renee The Studio to be the best fit. They were able to come to the hotel the day of my wedding, and for my trial, they were able to accommodate coming all the way to Mount Dora where I live. All I wanted was my hair to be curled down with something simple like a braid pinned back. I didn’t want to much going on since I wore the tiara. 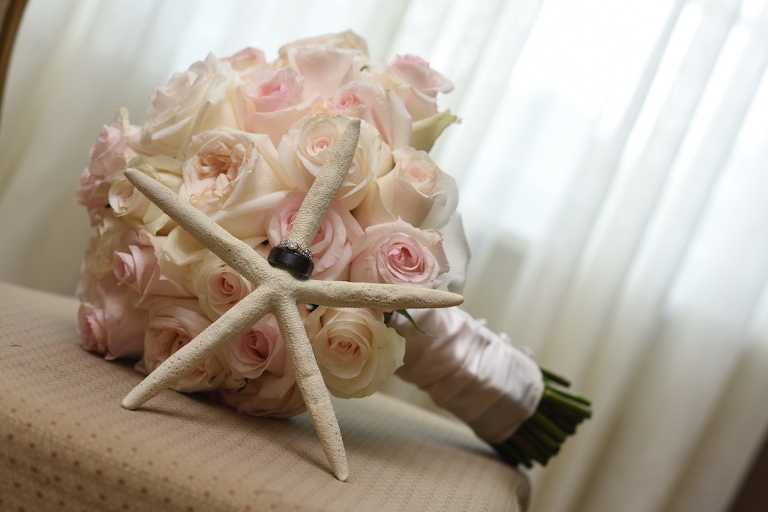 Hire a good photographer because the pictures that are captured are what you have to live by. Mika and Andrea’s outdoor Clearwater Beach wedding featured a Disney-inspired theme with a purple and yellow color palette. “Our wedding was themed after the Disney movie Tangled, as well as the Disney Parks. The theme came after discussions about colors and an initial theme that lacked personality. We wanted to celebrate our love, our way, but most importantly we knew we wanted it to be the most magically memorable experience for us and for everyone involved,” Mika shared. The Orlando couple thought they would have a wedding at their home, but changed their minds after visiting the Hilton Clearwater Beach. Searching for a Clearwater Beach wedding cinematographer, the couple hired Bonnie Newman Creative to capture not only footage of their wedding, but also their surprise flash mob! Looking back, the couple shared their most cherished wedding day memory. “If we’re talking about a realistic memorable moment, it would probably be our dads tripping in the sand while walking us up the aisle, but who’s paying attention? When it comes to the thing we talk the most about, our dances probably take the cake. We put so many hours of work into them over the course of a year, and we were so excited to see the looks on our guests’ faces when we surprised them with our choreography and dance skills,” the couple reminisced. What did you look for in a wedding videographer? We searched for someone who would be able to capture our ceremony and reception including all of the theatrics we had planned. We were looking for a cinematographer, not a videographer, someone who showed extreme passion not only about cinema, but about us. We also wanted someone who was talented enough to capture footage of the more complex pieces of our wedding, like the flash mob! Bonnie Newman Creative exhibited the exact style we were looking for and was able to capture all of the emotions her clients were going through. Hiring Bonnie was one of the best decisions we made in our wedding planning. She took a serious interest in us as a couple, and I’m happy to say we made a good friend in the process. She got to know us and got excited about our love and our wedding and put a lot of thought into executing the timeline efficiently and effectively. Our wedding was themed after the Disney movie Tangled, as well as the Disney Parks. The theme came after discussions about colors and an initial theme that lacked personality. We wanted to celebrate our love, our way, but most importantly we knew we wanted it to be the most magically memorable experience for us and for everyone involved. Given that our story started with a Disney proposal, it only seemed fitting. Our love for all things Disney and our drive to help each other accomplish our dreams meant that Rapunzel would be our perfect role model for the wedding, and the movie Tangled helps us share our romance in an animated way. Purple and yellow were the colors from the movie Tangled and since it was “our” story, it was only appropriate to spread the theme in this way. After realizing that I met the woman I wanted to spend the rest of her life with, I found the best ring, and set out to create a whimsical Disney proposal. The magical day came fast, and although it was one of the coldest in Florida, the proposal was definitely a memorable one. After exploring the attractions of Disney’s Epcot, I asked Mika if she would like to have pictures taken inside a photo booth. Without hesitation, Mika agreed and we stepped inside and found comfort and warmth in each other’s arms. The camera was set and the countdown began. First photo of smiles, second photo making a funny face, third photo embraced in a kiss, and then the ring came out, held in a shaky hand, sparkling from its box. Although Mika’s reaction was priceless, it was not photographed, as the booth only shot three pictures and not the expected four. Mika was still asked the infamous question, complete with giggles and tears and of course she said yes! After several minutes of crying and being good sports, we staged a new set of photos displaying the ring to share the story of the entertaining proposal. Despite the layers of clothing, thick winter jackets, rain clouds, cold hands, and a less than perfect photo finish, the day was an unforgettable. We were actually originally thinking of foregoing a venue in favor of a home wedding, but we toured the Hilton Clearwater Beach for fun and ended up falling in love with it. The scenery and everything that were included in their package drew us in. It matched our inspiration and stood out, and it gave us the right amount of space and a setting that we will never forget. Aside from the location, the Hilton offered linens, AV, (everything under one roof, less having to go other places) and their menu for dinner was interesting and delicious. BREATHE! Take your time and plan ahead. Communicate with each other. It’s best if you go into the whole wedding planning process knowing what each of you is looking for. If there is one thing we can stress enough, it is to be patient and understand that crazy things do happen!